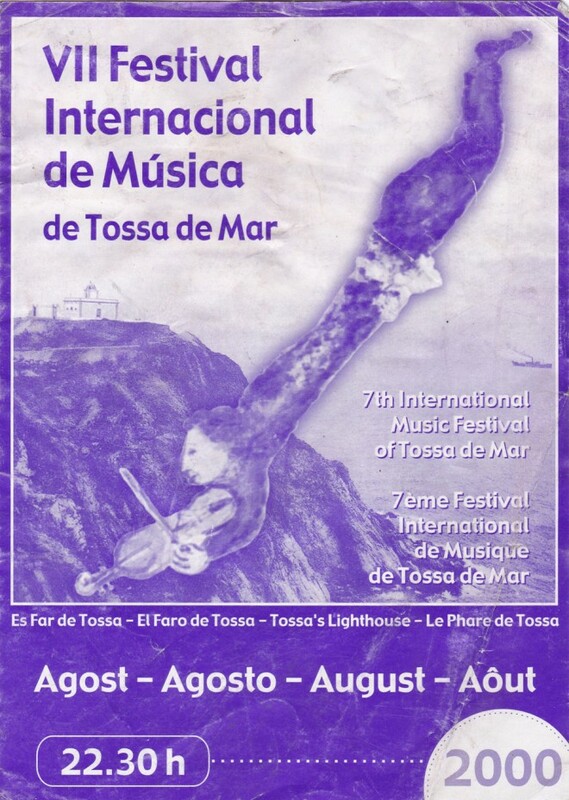 Tossa is a small emblematic population of fishermen of the Costa Brava to average way between France and Barcelona. One is in the province of Girona, in the region of “the forest” and during the Roman time it was called Turissa. The “Beautiful Villa” is the only medieval fortification that still exists in the coast of Catalonia and was declared historical monument and artistic national in 1931. In this frame we carried out one of our first performances in an International Festival. The Pork’s (Traditional Celta Music) day 2 of August. The Orchestra of camera of the Empordà that it interpreted pieces of: W. A. Mozart , of E. Toldrà and of A. Vivaldi under the direction of Carles Coll and like soloist violin Chris Nichols . They appeared day 4 of August. Quartet Siberia (Russian Pop music) day 8 of August. We appeared day 10 of August. 4 Per 4 (quartet of cord) that presented/displayed works of W.A Mozart and of Ottorino Respighiday 12 of August. Cantus (Old Music for voice and Laud). Soprano: Clear Bullet mold , Contra tenor: Oscar Bonany and Albert Bosch in the Laud . 17 of August. Our spectacle was accompanied by the group of Dance by Semblanza Mexicana and in the activities of the day some Latin American groupings appeared with which we made a parade by the streets to attract the tourists. That year, as many I suppose, stuck strong the tramontana but even so it was a very pretty performance and for the memory. Festivals like the one of Tossa of Sea, that opens their scenes to authentic proposals of the cultural diversity that is printed throughout Catalan geography allow to the coexistence and the knowledge of “the others” in a festive and cozy scope. It is important for us, Mariachi of Barcelona, to maintain and to participate in these spaces in where one is able through music to show the idiosyncrasy of a culture like ours, the Mexican.